Rating: 4.0 of 5. 2 vote(s). Click the rating bar to rate this item. 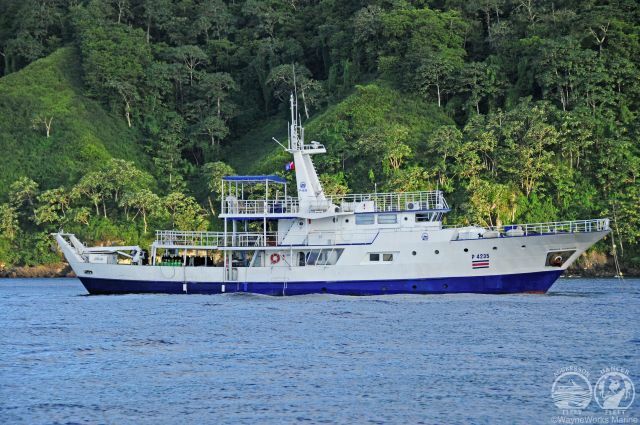 Okeanos Aggressor 1 is a 34 mts / 111 ft dive boat with steel hull and capacity for 22 divers. 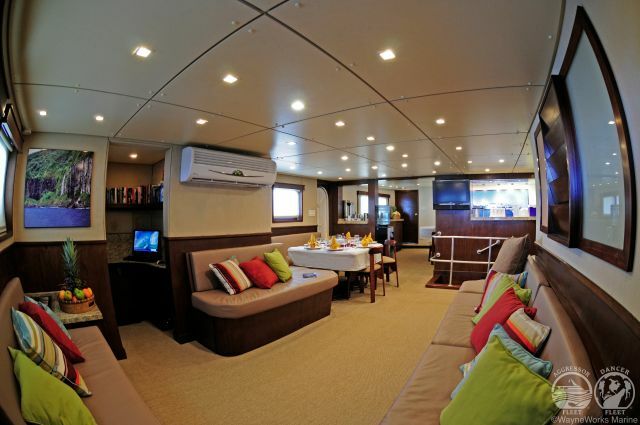 This comfortable and spacious dive vessel was built in 1972 and renovated in 2011. 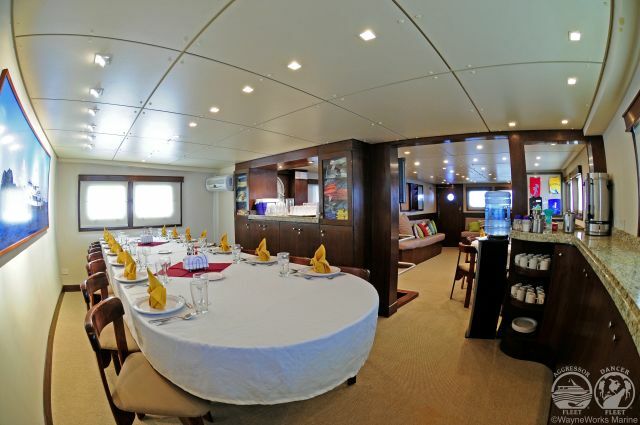 The boat is equipped with a quad cabin for 4 pax and 9 deluxe rooms. 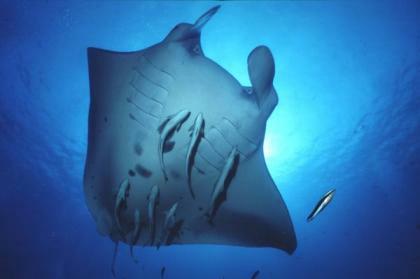 The duration of the diving excursions to Cocos vary between 8-10 Total days and 5-7 diving days. Puntarenas on the Costa Rica’n Pacific Coast is starting and ending point of the trips. 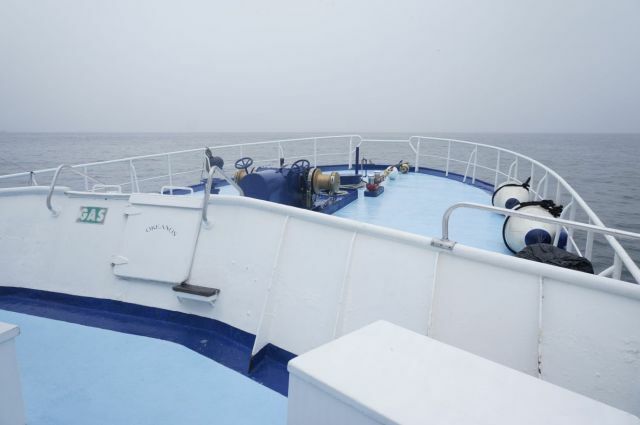 The journey to Cocos (and back) takes about 32 hours. 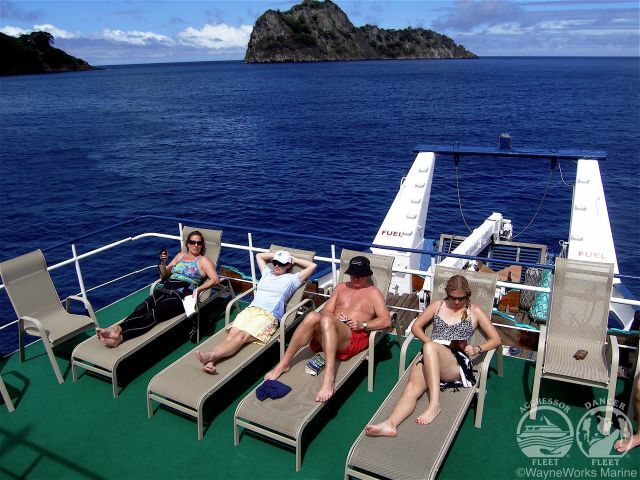 The diving safaris to the Catalina islands and the Bat islands have a regular duration of 8 days / 7 nights including 6 diving days in various Islands and Islets along the Costa Rican Pacific coast. A beautiful and newly incorporated dive expedition! The menu is varied and extensive, with a selection of American dishes, BBQ and local cuisine. You wake up with fresh fruit, hot entrees, cereals and juices. Lunch will be served in the buffet and offer hot soups, homemade breads, sanwiches, salads and / or entrees. The dinners are prepared and served by the chef. Salads, vegetables, beef or chicken, seafood, and homemade desserts are part of the daily gastronomie. Available beverages are soft drinks, fruit juices, water with ice, ice tea, coffee and a selection of wine and local beers. Type: 2-engine steel vessel. Length/Beam/Draft: 36 mts/110ft, 7 mts/24ft, 3 mts/11ft. Engines: 2-Deutz diesel engins each with 300 hp. Cruising speed/range 10 knots/1500 nautical miles. Water tank: Capacity 4.000 gallons, watermaker provides 1.600 Gallons per day. Communication: SSB Mariner radio with AT&T Access. 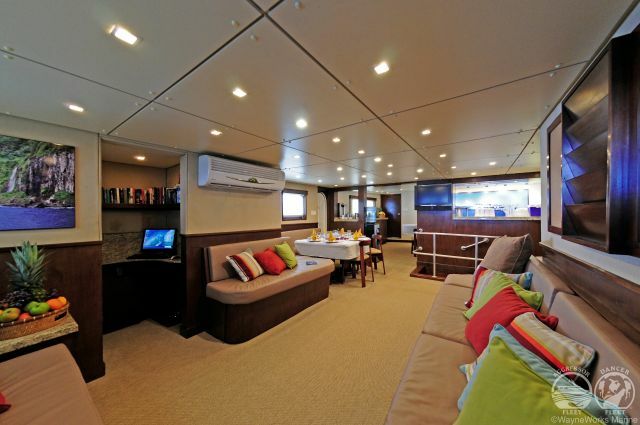 Okeanos Aggressor has a spacious salon, 40 feet of sun deck, deck chaires, chaise lounges, grill, bar, library and a complete photo center. NTSC and PAL are the onboard video formats. The Okeanos has a security box on board wich can used by the guests to store valuables such as credit cards, passport, cash etc. 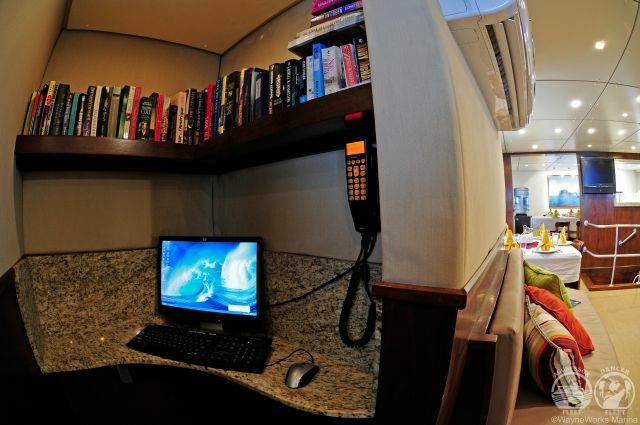 Email via satellite system is available on board for an additional charge. 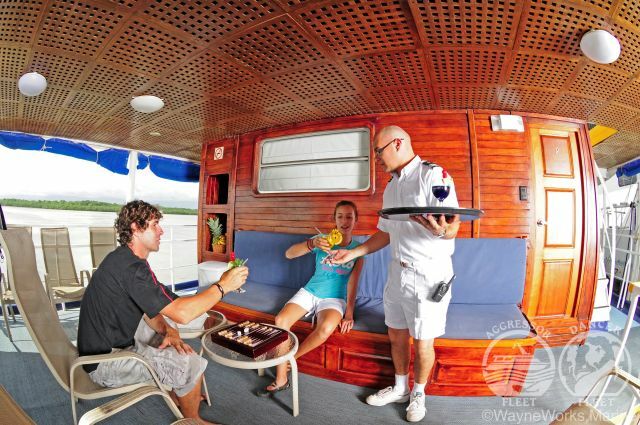 International calls can be performed both on the yacht as well as in the bay of Puntarenas. 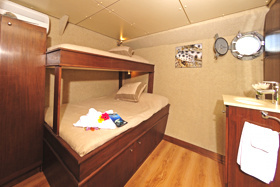 The ship is equipped with 9 comfortable deluxe cabins. 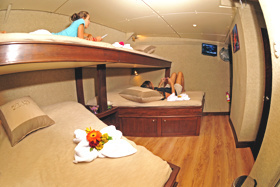 Each has a queen size bed and a narrow single bed on the top of it, bunk bed style. 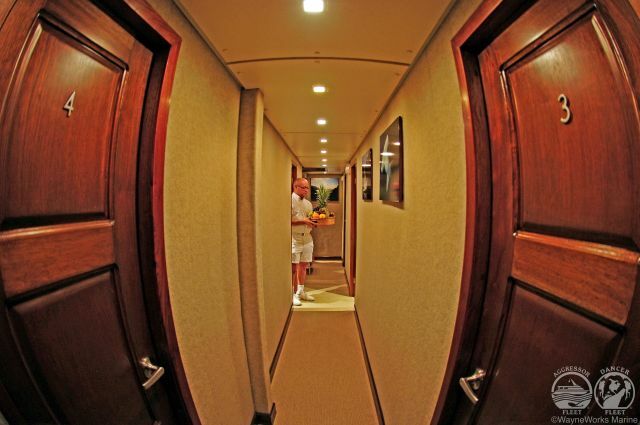 All the cabins provide a private bathroom with warm water, hair dryer, TV / VCR and window. 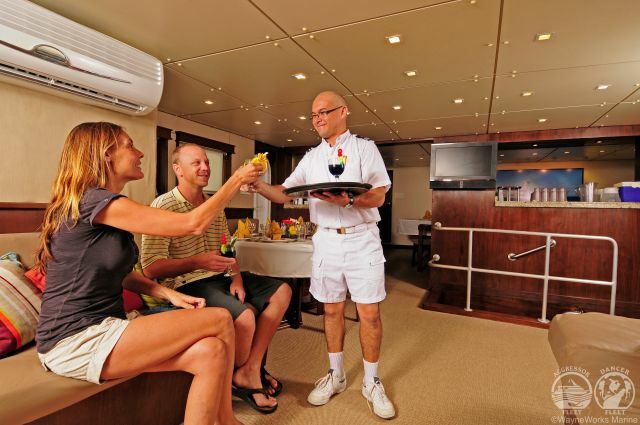 Cabin number 10 is a quad cabin with capacity for four pax and 2 queen size beds, two single beds and a private bathroom with shower, TC / VCR, and window. 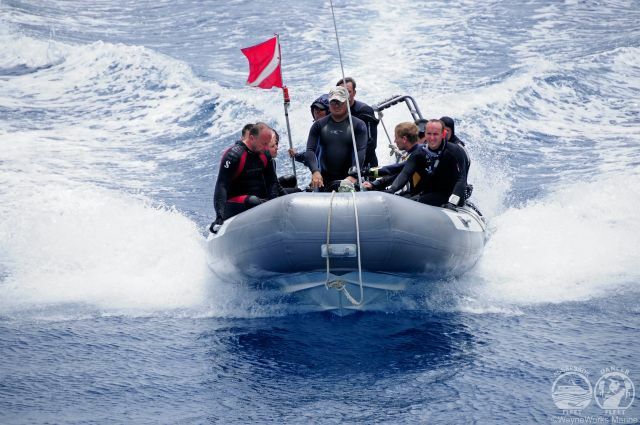 Up to 4 dives daily are possible: 3 scheduled boat/zodiac dives and an optional night dive. Due to the new regulations in Cocos there are only 3 night dives offered. 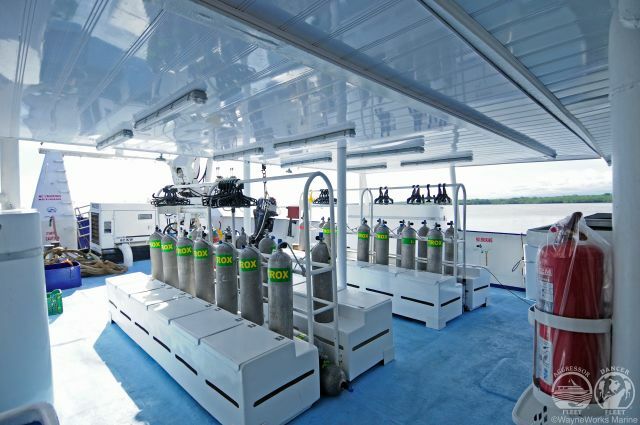 Okeanos is equipped with a full line of Aqua Lung rental gear. Available equipment: BCDs, dive computers, night-lights and foto equipment. Safety: EPIRB emergency position system, fire extinguers, first aid kits, defibrillator and DAN O2 systems. There is a personal locker provided with ample storage space for your diving equipment. The Okeanos Aggressor has a strobe charging station (110 and 220 V) and a large camera table available for your video and camera equipment. Please bring your own battery chargers. Skiffs; two 22 ft zodiacs. There is ample space for your camera and video equipment. You will be picked up by the Okeanos crew at your host hotels in San Jose and transfered by bus to Puntarenas (2 hour trip), where the vessel is waiting for you.